Richard Pryor was another African-American who just so happened to develop multiple sclerosis in spite of the statistics to the contrary. His diagnosis came in 1986 at a time when it was rare for people of color to get MS. He was a brilliant stand-up comedian who also did film and television. The subjects of his comedy included racism, race relations, politics, African-American culture, and everyday life, to name just a few. richard Pryor - who was he? If you grew up in the 70's and 80's, you no doubt have heard about and watched this iconic figure on TV. I'm sure his shows were "cleaned up" for prime time, however, if you attended his live shows, you were sure to see his true self. He was very straight forward and didn't hesitate to use language that some people thought was vulgar and profane. Even with this, he was still very popular and influenced many comedians who came after him. Some artists who attributed him as influencing their choice of career, included Eddie Murphy, Dave Chappelle, Chris Rock, Robin Williams, Bernie Mac, George Carlin, and Whoopi Goldberg. From what I can see by reading about his life and watching a few of his routines, Richard lived life to the fullest. We would all do well to take on this attitude. Life is too short and too precious to live half-heartedly. His life and the legacy he left will forever touch the lives of those who follow, whether directly or indirectly. One thing I learned about him was that he even hosted a children's show in 1984 called Pryor's Place which was very similar to Sesame Street. Here's a video clip about it and I'm sure you can find a few episodes if you looked for them. One of the things I always remember about him was his smile. Even after he was diagnosed with MS, he continued to remain active as a comedian. He worked until around 1999, when multiple sclerosis finally brought his career to an end. "In 1986, Pryor was diagnosed with multiple sclerosis, a degenerative disease of the central nervous system. But that didn't stop his performing. In 1992 he could still be seen live at the renowned Comedy Store in West Hollywood, making jokes about his afflictions and his wheelchair and still painting incredible verbal pictures that stimulated the imagination of the audience so much they actually lived and felt the experiences with him." Richard was born on December 1, 1940 and died on December 10, 2005 at the age of 65. During his last few years he needed an electric scooter to get around due to worsening mobility problems. 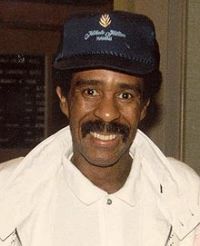 "Although his multiple sclerosis prevented him from performing in his last few years before his death in December 10, 2005, from his home in the Encino, which he shared with his two rescued dogs, Homer and Spirit, Pryor's mind continued to catalog the events of his life and the world around him. Richard Pryor will never lose his position as cultural icon and we can only hope that a cure to this debilitating disease will soon be found so as not to loose another soul that reaches out and touches as did Pryor and his ability to allow us to experience our reality with the outrageous, profane, and scabrous perspective that only he imparted." If you love animals as well, why not consider making a donation to his organization? As I said earlier, his legacy lives on even though he is not physically here with us. RIP, Richard. We love you! Go back to Famous People with MS O-P.